The Musings section is basically where you'll find day-to-day thoughts and mumblings. Sometimes focused, sometimes not. Tuesday, August 19, 2003. It's a nice, quiet, boring morning before heading to the airport for my flight home. At least, that's what's supposed to happen. Monday, August 18, 2003. Chris wanders around Montreal. Sunday, August 17, 2003. The tournament finishes with some amazing games, some contested calls, a crazy game of flutter guts, and a familiar face (or back) on the evening news. Saturday, August 16, 2003. We survive a long day of games and shift north to Montreal, but not without a harrowing drive (or three). Friday, August 15, 2003. Chris works his magic in building a Beer Garden, then feels the karma of not having had to make any major calls in the previous day's play. 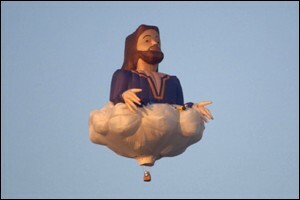 Where's the Jesus Balloon when you need it? Thursday, August 14, 2003. The tournament gets underway, and everyone discovers just how isolated we are from the rest of the world. And Chris sees Jesus floating in the heavens. Wednesday, August 13th, 2003. Chris fumbles through Hartsfield, stumbles into Montreal, and learns the joys of Canadian currency, gas prices, and taxes.